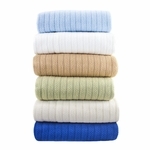 A variety of wholesale blankets available in bulk by the case in several fabrics popular for hospitality use including; 100% Cotton, Fleece, and down-alternative Quilted Microfiber. Our blankets are designed and manufactured for hospitality, guest lodging, and commercial business use. From budget hotels, camps and intern housing to high-end resorts, spas, and furnished rental properties, you will find blankets in bulk that are perfect for your property, budget, and guest needs at Palmetto Linen Distributors. All blankets are in stock, ready to ship within 1-2 business days. Questions about our blankets or wondering which option is best suited for your business needs? As a full service wholesale distributor and manufacturer, you can reach out to us for friendly, knowledgeable guidance anytime. We have years of hospitality textile experience and are happy to help you find the right blankets for your specific hospitality needs.